Spring has come, and the cycling season is upon us. This year, I have decided to combine my love of history (especially military history) and my love of cycling. I’m calling this new campaign: Bike Wheels & Battlefields, and I’ll be sharing some of my (hopefully) more interesting adventures here. I slipped out of bed at 6AM after five or six hours of broken sleep which included at least two long stints in a rocking chair with a wiggly toddler. I ate a quiet bowl of mini-wheats and studied my route on the Ordnance Survey maps. For those people not from Britain, OS maps are amazing, like Google Maps before the internet. They grew out of military mapping and now you can buy an OS Map for every single corner of Britain. The incredible detail of these maps outlines every building, every ancient monument and ruin, ever contour of the land, and even, in theory, everywhere you can get a drink. I would be traveling across two of these maps on my journey (OS 138 & 150), and they would be my only guides. In fact, the only digital devices I would take with me were a cheap mobile phone (incapable of internet connection) which I carried for emergencies and to tell the time and a digital odometer to keep track of the miles. This isn’t to say I had shunned the internet in my planning. In fact, Google Maps was the first thing I checked when planning my journey. According to Google, the journey to Richborough would cover 25 miles and take just over two-and-a-half hours. I knew better than to believe either of those numbers. Now, I don’t doubt that Google is pretty accurate that the route was near about 25 miles, but that’s only if I managed to follow it exactly, taking no wrong turns and no detours. 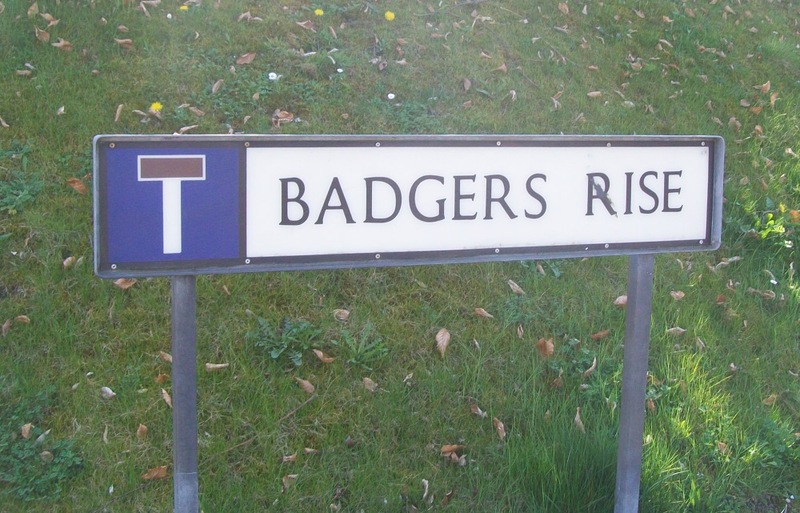 Considering my inherent lack of direction and suspect map-reading skills, this seemed unlikely. The 2.5 hours is more mysterious. I’m not sure how Google calculates cycling times, but I suspect they ask someone like Chris Froome or Geraint Thomas to cycle the route and report back. I knew I would be lucky if I could complete the route in under 4 hours. I was setting out from the town of Hythe, and even though both Hythe and the fort lie near the coast, my plan was to turn slightly inland, in order to cycle the back roads of Kent. This, unfortunately, involved going up and over two major ridge-lines, first above Folkestone and then again above Dover. I am not the kind of cyclist that enjoys big climbs for their own sake, but if I must endure them to reach my goal, I will (and I’m not above getting off the bike and pushing either!). I left the house at 6:30. The sun was already shining bright with the promise of a warm day to come. I rolled down my hill and through Hythe, encountering almost no one on this quiet Thursday morning. In a few minutes, I was by the sea, listening to the waves roll against the shingle. 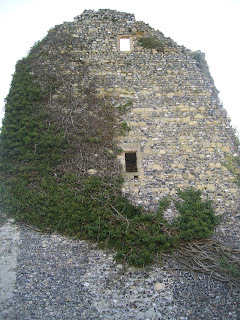 At some point, I passed Sandgate castle, but it is so crowded in by the town around it, that I blinked and missed it. Before 7, I had reached the end of my easy shoreline cycle to Folkstone. The route now went up, and up, and up. In fact, it continued up for about 500 feet over a depressingly short distance. I passed Folkestone’s pair of Martello Towers (Napoleonic-era gun towers), but was so busy grasping for breath that I spared them nary a glance. I had little time for distractions today. Twice, I had to stop and carry my bike up a set of stairs, but mercifully the second set lead me to a quiet cycle path that finally brought me to the top of the ridgeline. It was a pretty brutal start to the trip, but I was at least rewarded with fantastic views over Folkestone and out across the English Channel. Back on the level, I continued on my way in higher spirits. I cycled pass the Battle of Britain Memorial, which appeared to have a nice little museum as well as a Spitfire and Hurricane parked outside. It was definitely something I would have to visit in the future. I rode through the small town of Caple-Le-Fern and then out into the quiet Kentish countryside. One of the great things about Britain for cyclists is that it is crisscrossed by numerous little country roads that are rarely used except by farmers and the few people that live in the scattered hamlets. When cycling in the middle of a weekday, it’s not unusual to cycle for an hour down these little roads and encounter next to no-one. As I was cruising along, enjoying the sun and the bike-generated breeze, I saw a dark and craggy shape looming through some trees. It was hard to make out at first, but it was clearly some sort of ruined tower. Despite my plan not to get distracted, I decided to take a quick detour to get a closer look. 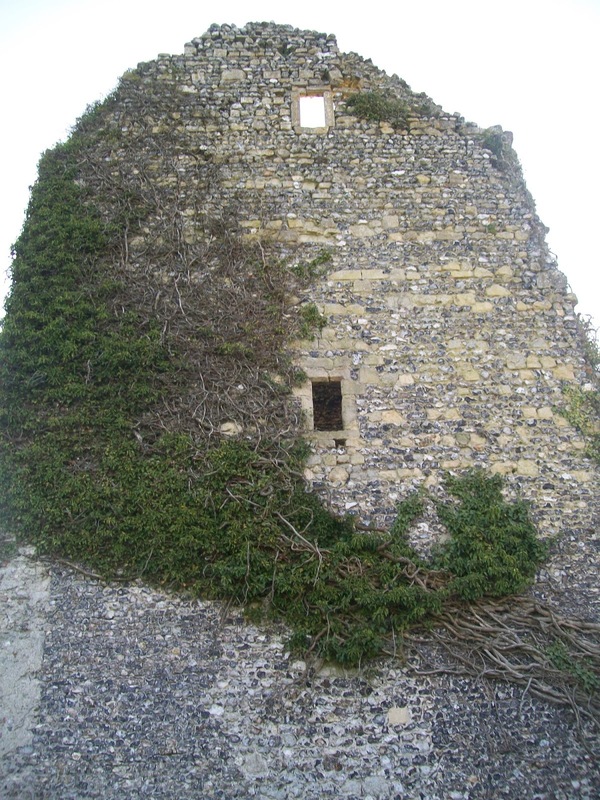 The impressive remains of the St. Radigund's Abbey gate tower. From the Abbey my route ran down, down, down. While it is fun whizzing down the hills, it is also rather depressing to give back all of that hard won elevation. A little while later, I rolled into the delightful little town of River, which is kind of a suburb of Dover. By now it was 9:30 and time for a break. 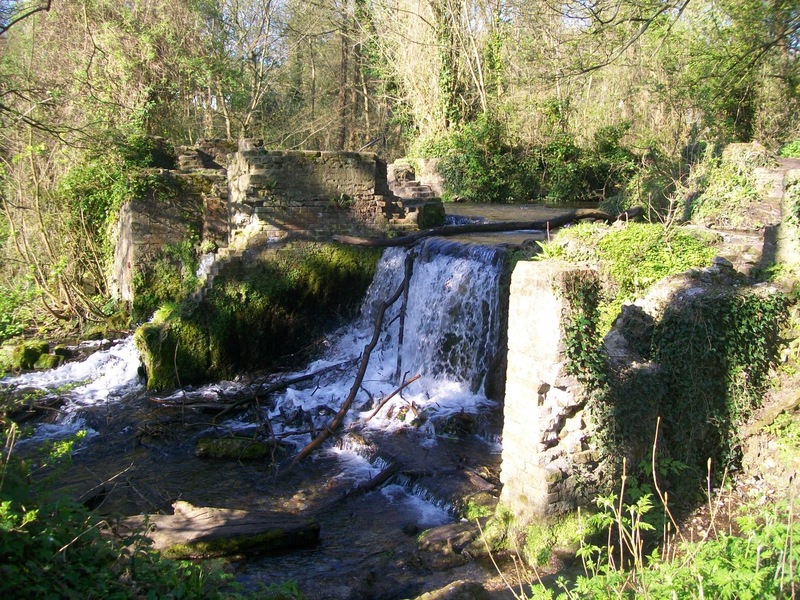 I pulled into a little park by the river Dour, and found a seat near where the river cascaded over the remnants of a watermill. Listening to the pleasing sound of the water, I ate a sandwich, and thought about my destination. My picnic spot in the town of River. 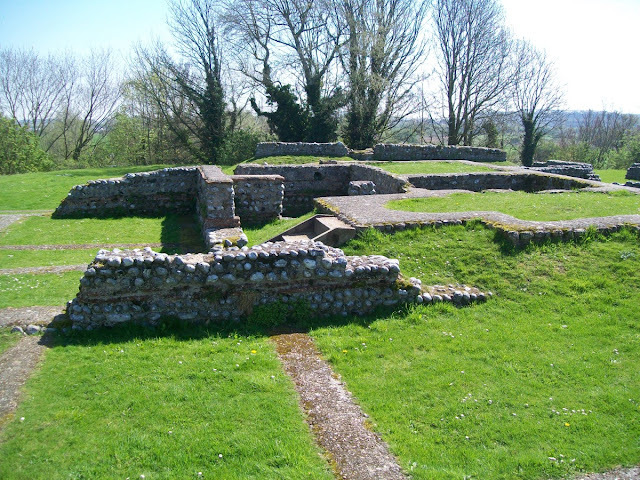 I am far from an expert on Roman Britain, but I know enough to be impressed by the importance of Richborough. It was at this site in 43 AD that the first Roman troops of the invasion of Britain came ashore (The invasion under the Emperor Claudius, the one that stuck, not the earlier attempt by Julius Caesar). It would serve throughout that campaign as the main supply base of the army. Later, a port town called Rutupiae grew up around that initial beach head, as the site became the main crossing point from Gaul to Britannia for Roman couriers and the like. Sometime in the later 3rd century, some of the town was destroyed to make way for a huge stone fortress, one of the new ‘Saxon Shore Forts’ designed to help defend the province against seaborne raiders. Significant portions of these walls still stand on the site, and served as the biggest draw to me. Why not spend a night at the Blazing Donkey? 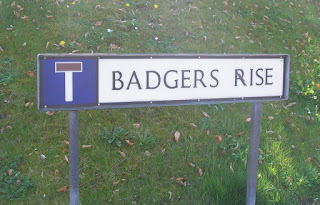 The map was true to its word, and I passed under the thundering traffic of the A2 and onto a back road of the town of Whitfield. Unfortunately, at that point, my map reading skills failed. Somehow I managed to do a complete circle around Whitfield and came back to near where I had started. Eventually, in exasperation, I asked some locals at a bus stop for help. They sent me tearing out of town on a wonderful bike path through the countryside. Not the path I was supposed to be on, as it turned out, but lovely! Thankfully, I wasn’t headed in the complete wrong direction, and once I figured out where I was, I was able to get back on track having only spent a few extra miles of pointless cycling. The extra cycling did have one other effect, I was now dangerously low on water. Although the day was only pleasantly warm, cycling in any weather requires near constant hydration. I was just beginning to get worried about this when I reached the town of Eythorne and their very welcome village shop. I immediately went in (enjoying a couple minutes of blessed air-conditioning) and bought a bottle of water and a sports-drink. The sports drink was consumed in the parking lot, the water was poured into my bottle. The names continue on the other sides. While I was drinking in the little parking lot, I noticed that the parking lot also contained the village war memorial. It seemed only appropriate and respectful that I take a minute to read the names. 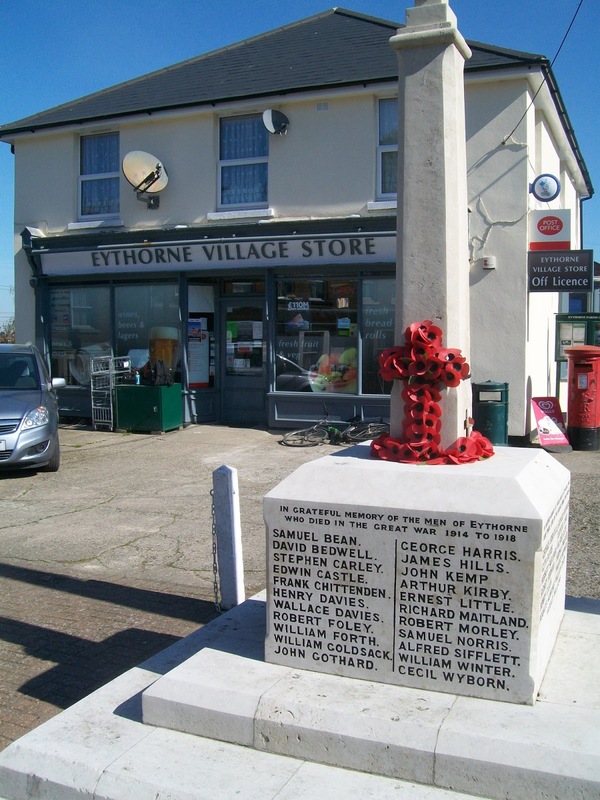 Now, Eythorne is a little spot of a town, and one suspects it was even smaller during the World Wars, so how could they have lost so many sons… I think, perhaps, this is the best way to understand how crushing the World Wars (especially the First) was to Britain. Every little town has one of these memorials, covered in names. Despite these sombre reflections, I left town in good spirits, aided by the sugary sports-drink. From Eythorne I continued on the back roads to the town of Eastry, where I happened to glance down at my handle bars and realized that I had left my bike lock at home. I give myself credit for not shouting anything to discredit myself, even if there was no one around to hear. However, I must admit that several choice expletives did come to mind. Every time. It happens every time I clean my bike; I take the lock off the handle bars and forget to put it back on. I had cleaned my bike the day before in preparation for the trip, and once again, left the lock in the shed. Well, there was nothing for it. I decided to press on and hope to luck that I could find a bike lock somewhere along the way. 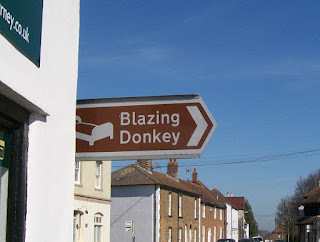 Perhaps because of those thoughts, I managed to make a wrong turn leaving Eastry and found myself on the main road leading into Sandwich. Thankfully, it was only a short ride at that point, and my only time spent on a large road ended quickly. In fact, maybe the wrong turn was a bit of fate or luck, for as I wheeled into Sandwich, I saw a sign for ‘Locks of Sandwich Cycles’. (Seriously the name of the shop is ‘Locks’). It gave an address on King St, and although my map was too large to give names to small city streets, I found the place with little difficulty. A few minutes later, I was in possession of the cheapest bike lock that money could buy! (In Sandwich at any rate). Sandwich appears a pleasant town, and even on a Thursday morning before lunch the place was buzzing with shoppers, a small market, and outdoor cafés. I had no time or interest in such things at the moment; however, and I powered on through the town and straight passed my turn. 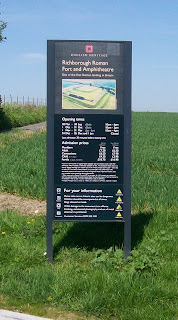 Another mile or two wasted, I got back on track and even saw a sign for Richborough Roman Fort. As I whizzed by the sign, I just caught a glimpse of ‘Open every weekened…’, wait, what? For a moment, I felt very, very foolish, but I decided to ignore it and press on. Another mile and I had arrived. I quickly checked the sign and confirmed that the site was open – it is apparently open every weekend during the year, and every day in the spring and summer. It is a good that I hadn’t come three weeks earlier. Anyway, I had finally arrived. According to my odometer, I had covered just over 32 miles. According to my phone, it was 11:30, almost exactly five hours after I had set out. Of course my awe was interrupted by the practicality of there being nowhere to put my bike. I suppose they don’t get many bike-borne visitors, but really a simple pole or two would do the trick. In fact, it occurred to me that the chance of my bike getting stolen in this place was near to nil, but, chained up, I at least wouldn’t have to worry about it. So, I did the best with what I was presented, and chained the bike to the gate that is obviously used to let vehicles into the site. I figured the grass looked recently mowed, so probably no one was coming. From the parking lot, it was a short walk to the site entrance. I must admit, my first thought on stepping inside was ‘They have a fridge with Coca-Cola. YES!’. Clutching my ice-cold treasure, I approached the counter. If the woman had any thoughts about this sweaty, dirty, dishevelled, bearded, little man, she admirably kept them to herself. Instead, she checked my English Heritage membership card and sold me the coke and guidebook. If you’ve ever been to an English Heritage site, you’ve probably seen their guidebooks. I can whole-heartedly recommend them as a series. They give a good historical overview, are filled with interesting factoids about the site that you will otherwise miss, have loads of nice photos, and generally contain some really nice paintings that reconstruct the site as it would have been in its heyday. And, they seem reasonable priced. I decided to start my tour in the small museum. Well, very small museum. Just one small room, with a few artefacts found at the site. 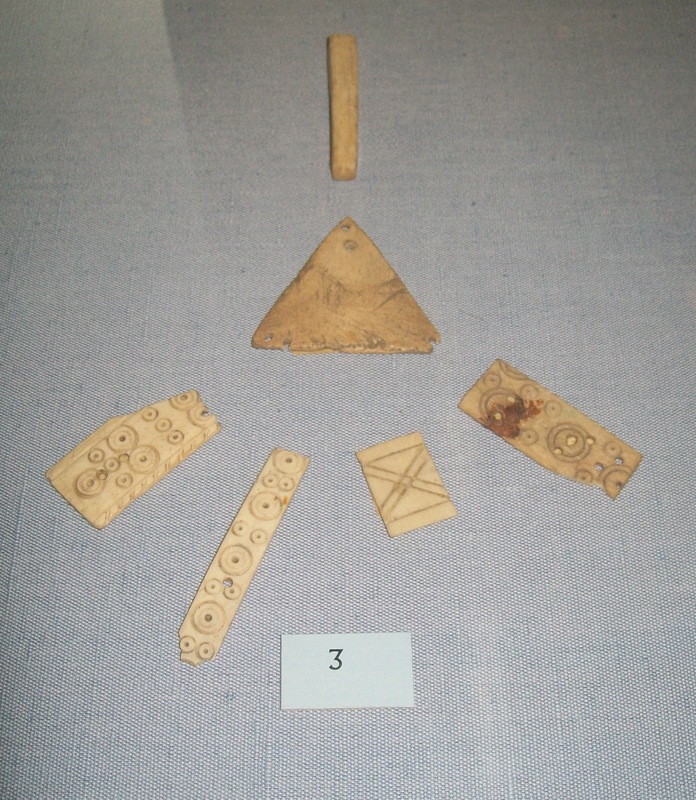 In truth, the best artefacts were actually reproductions as the originals had been taken away to the British museum. Still, two items caught my eye. One was a group of decorative pieces thought to have adorned a roman dice tower! I knew the Romans were big on their dice games, but I always assumed dice towers were an invention of the modern game community (look, I make my living writing dice-based games, so it was cool to me). The other was a bronze swan head (reproduction) noted as being for the prow of a ship. However, the whole thing was about the size of an actual swan head and neck, which struck me as strange – so I’m not sure if it was an actual ship decoration or a piece of some kind of model. 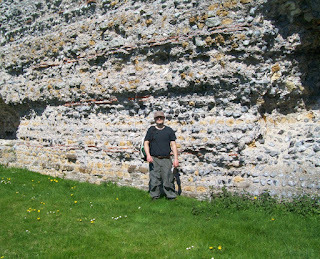 Tossing the empty coke bottle in the trash as I exited the museum, I stepped back outside and starred up at the mighty wall in front of me. 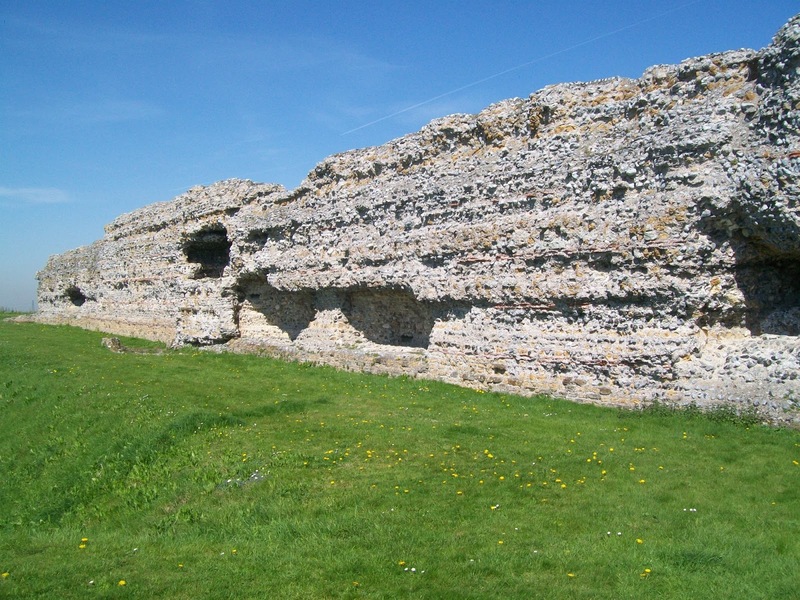 The walls at Richborough still reach heights of 8 meters, thought to be where the parapet stood, which gives a good feel for what it must have been like to approach these walls under the watchful eyes of the Roman soldiers. Stepping through a broken hole in the wall, I was immediately struck by the scale of the fortress. Because three walls are still standing, or at least large sections of them still are, you can really get a sense of the place. Inside the walls, the site is a confusing landscape of ditches, mounds, foundations and low ruins. Each of these are explained by plaques dotted around and even better in the guidebook. The most interesting spot is in the direct centre, where a pair of earthen mounds come together to form a cross. Apparently, after years of scholarly research, this was finally understood to be the base of a monumental, four-sided archway that stood 25 metres tall. It was likely built partly to commemorate the conquest of Britain, partly to awe the natives, and partly to serve as the ‘gateway to Britannia’. At the time there would have been nothing like this in Britain, nothing even close. There is a beautiful reconstruction in the guidebook of what it must have looked like looming over the port in later years. Sadly, the great archway was torn down when the main fortress walls were constructed. (The Romans really were a strange combination of ostentatious and practical). You can see the cross foundation of the arch in the middle of the shot. 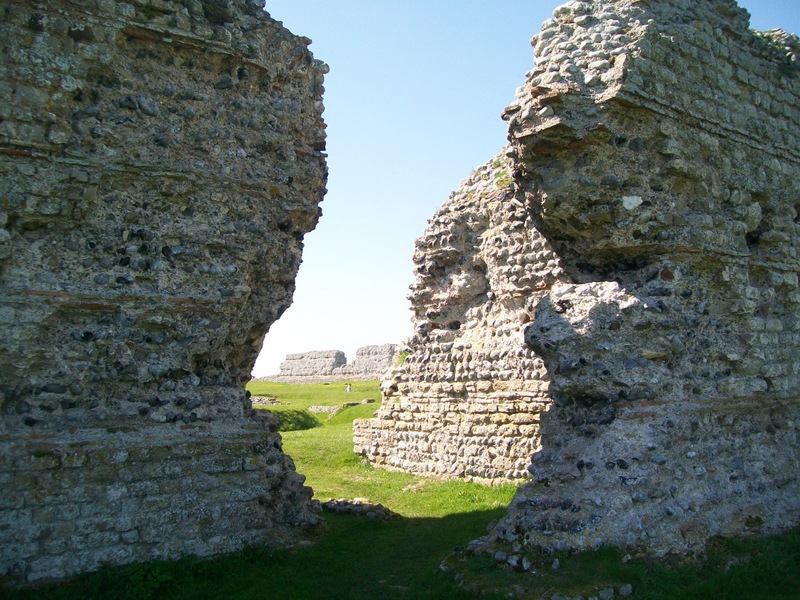 In all, I spent an hour-and-a-half at Richborough, mostly just wandering, imagining Roman soldiers patrolling, and admiring the heft of the remaining towers, that some suspect may have been made to hold artillery pieces. I would have happily lingered – it was a beautiful day, and just the kind of spot I like to stop and read a book – but, considering it had taken me five hours to reach it, I decided I had better not dawdle. Possibly the ruins of the military commander's house. ‘Should we order pizza? I’ll have a large pepperoni’. As I said near the beginning, the phone was for emergencies. The road up out of River is so steep and so long, I had no chance of cycling up there. Instead, I pushed my bike and my sweaty-self up the long bending road, smiling politely at the mothers collecting their children from school. That hill truly seem to go on forever. If they do, we are doomed! Having eventually climbed up those 500 feet, I got back on the bike and started to roll once again, down the gentle backroads behind and above Folkestone, admiring the view, and knowing that the worst was behind me. I rolled down through the town and back to the shore, where nearly everyone was coming out to enjoy a sunny day on the beach. I had to cycle slowly because of all the people, but, in truth, ‘slowly’ was now my maximum speed anyway. I was so cooked, it was all I could do to make each pedal stroke and bring myself that little closer to home. It was 5:30 when I pulled up in front of my house, eleven hours after I had set out. My odometer told me that I had done 59.93 miles, which I happily rounded up to 60 in my head. It was a hard, but glorious day. I had journeyed, explored, got lost, delved into history, and finally returned home to a pepperoni pizza. 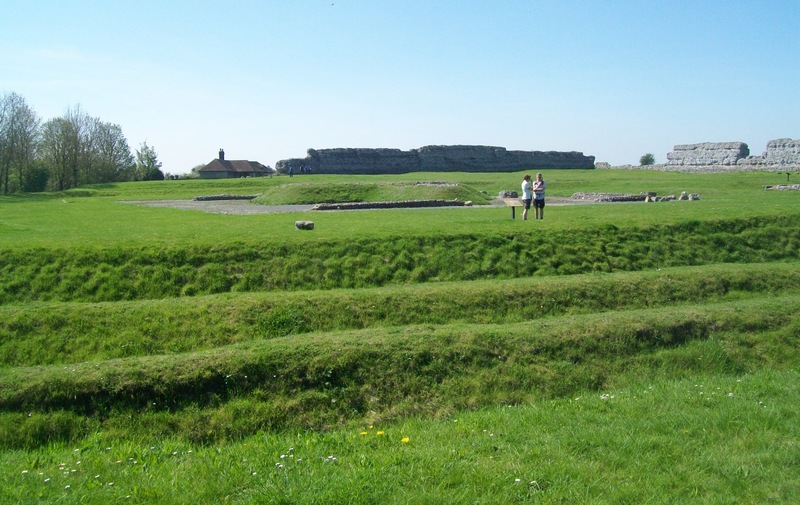 If you want to learn more about Richborough Roman Fort, you probably can't do better than the English Heritage Guide Book. If you want to learn more about the Roman Saxon Shore Forts in general, I suggest Rome's Saxon Shore by Nic Fields. 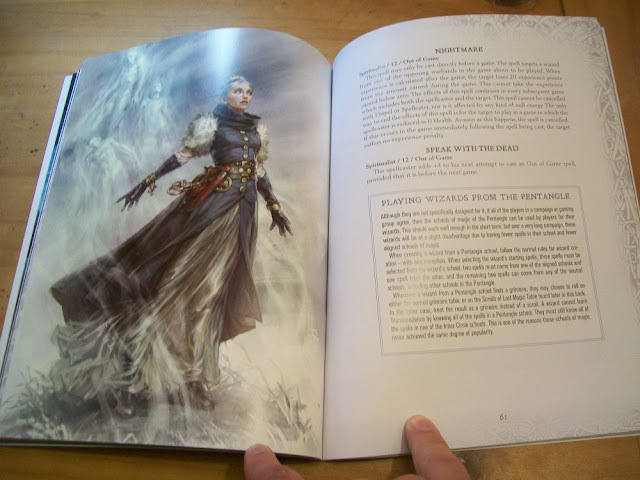 It is hard to believe, but it is almost a year since the last Frostgrave supplement set in the Frozen City (Ulterior Motives) was released. Well, that is about to change! 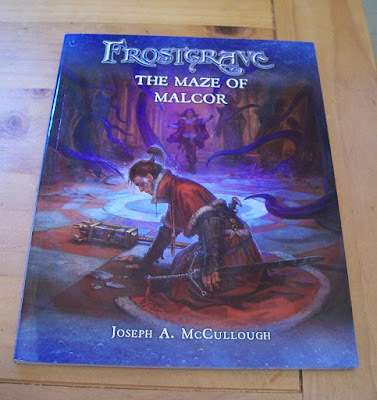 In June the game returns to the Frozen City in a big way with the release of The Maze of Malcor. Why is the Maze so big? Well, first off, it truly is bigger. I wrote 50% more words for this supplement than any of the previous supplements and this gave me a lot of room to play! The heart of the book is the 12 scenario campaign, all set in the recently uncovered, and partially ruined, ‘Collegium of Artistry’. The first 6 scenarios follow most of the conventions set out in previous supplements. However, after that point, the Wraith of Malcor, the last headmaster of the Collegium, becomes aware of the intruders, and starts sending his servants, the Wizard Shades, after them. The Wizard Shades can either be run as uncontrolled creatures or played by an additional player. 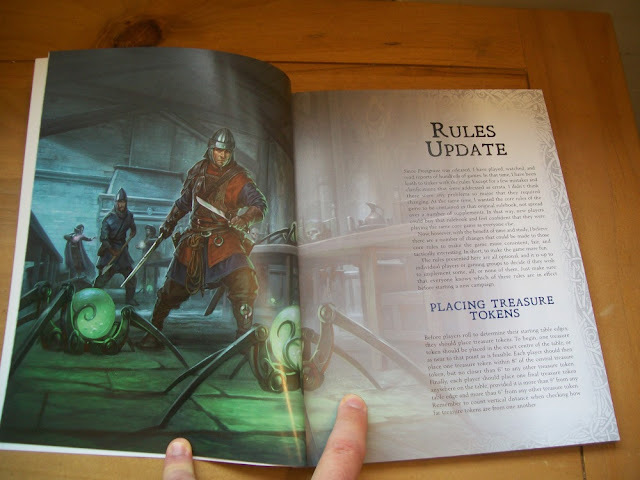 Also, for the first time since Frostgrave was released nearly three years ago, I have included a section of ‘rules updates’. These are my suggested changes to the basic rules of the game. They are optional (as is everything), but I think players who try them will agree they improve the game in a variety of ways. Included in this section is a new Experience Point table. Finally, there is a double-sized treasure table, and, of course, a bunch of new monsters to fight. Oh, and sky gondolas, did I mention that? Actually, June is going to be a big month for Frostgrave. Releasing at the same time as The Maze of Malcor is The Grimoire – a set of spell cards which includes all of the spells from the basic book and all of the supplements, including the Pentangle spells in Malcor. Also coming in June is Matthew Ward’s second (and somewhat darker) Frostgrave novel, Oathgold – no spoilers, but 'rangifer'. And will their be new minis? Of course there will! If that’s not enough for you, well, check back in a day or two for another small Frostgrave-related announcement. I am back in the magazines this month. Well, one magazine anyway. The new issue of Miniature Wargames (May 2018 - Issue 421) includes my article 'The Path to Frostgrave', which talks a bit about the process I go through taking a Frostgrave book from first pitch to finished product. The article also includes a new scenario, 'The Belfrey'. I originally wrote this scenario as part of the soon to be released Maze of Malcor, but, for organizational reasons, I decided to drop it from the book. I'm glad it has found its own home! The magazine contains a couple of other articles that were of interest to me, most notably the interview with Chris Tubb from Mithril Miniatures on his transition from traditional to digital sculpting. The new issue doesn't seem to be up on there website yet, but I'm sure it will be soon. Otherwise, it can usually be found at WH Smiths and will almost certainly be available at Salute this weekend. When I was a young man, just discovering Dungeons & Dragons, I thought it was hilarious that the game included a monster called 'violent fungus'. In fact, it wasn't until years later that I realized that misread my Monster Manual*, and actually the creatures were called 'violet fungus'. Disappointing. Years later, after I had created my own fantasy game filled with monsters, I took the opportunity to correct this cosmic-level oversight. 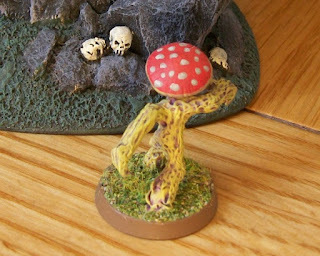 And so when I came to write Into the Breeding Pits for Frostgrave, the world gained mushroom men called violent fungus. Maybe nobody is laughing but me; but you know what, even if that is true, it was worth it. With the truth finally revealed, it is perhaps surprising that I have only gotten around to painting my first violent fungus recently. This little guy is part of a two pack from North Star. I love his big hands and his purposeful stride. This is a mushroom that has places to be! Just like the name, the model cracks me up. When I sat down to paint him, I did a quick internet search for 'weird mushroom' images. I found a suitably bright yellow and red one which I used as the basis for the model. So a couple of yellow/brown layers with a purple wash, and then a red top with grey spots to finish it off. Very simple, but such a characterful model only needs a simple paint job, I think. One of these days, I'm going to have to revisit the violent fungus and learn more about these strangely angry mushrooms. * I just checked and violet fungus are in the 5th Edition Monster Manual. You can find them under 'fungus'.